I am all moved in to my new apartment in Washington, D.C. and I'm happy to tell everyone that I absolutely love it. My parents and I went a little crazy at IKEA last week. We walked in with three things we needed: a couch, a dresser and two barstool-type chairs. And I have to laugh, because we must have walked out with nearly three times the amount of things I thought I needed. IKEA is pretty much a slippery slope, because once you enter you're doomed to buy little things you really don't need. 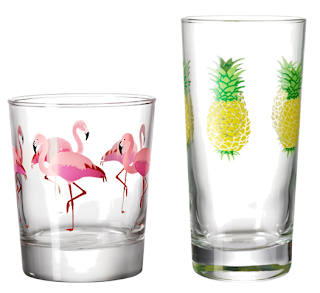 Prime example: I had enough glassware already (to the point where I didn't have room for it all), and then I saw these flamingo and pineapple glasses. They were only $1 and $1.50, so who could resist adding a few more dollars for these adorable glasses? I decided to go with four of the flamingo ones, because really it's all I had room for, but I think the pineapple glasses would be great for smoothies in the summer. What do you think? LOVE flamingo anything, and how could you not love that price?! SO cute. I NEED THOSE FLAMINGO GLASSES. I know where I'm dragging the bf next time he comes to visit. Plus he's never been to IKEA! IKEA!! It's been awhile since I shopped there. Love both of the glasses you featured here. So glad i found your blog. Love your posts! Love this blog and got a good model of glass..